This is becoming a new holiday fad. The tradition goes back to the middle ages when Europeans did it to represent the Holy Trinity. 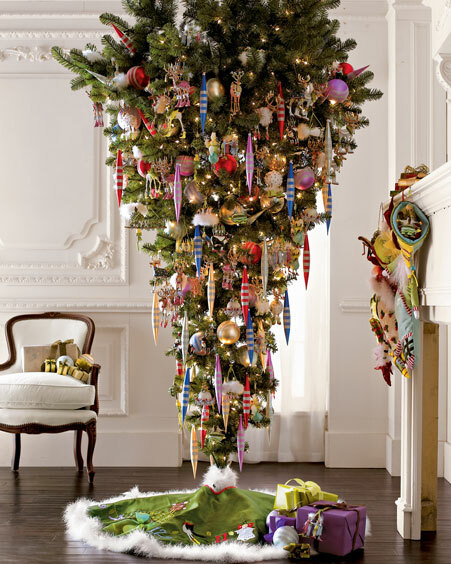 The trees are either attached to the ceiling or placed upside-down in a special tree stand. 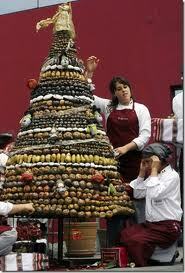 This Christmas tree was made of potatoes at a local institute in Lima, Peru December 4, 2007. Students made the tree using 98kg (216 lbs) of potatoes. Peru has some very special potatoes which grows 3,950 meters-above-sea-level. 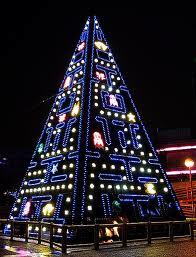 For some reason, this Pac-Man Tree in Madrid, Spain was only up for one December, in 2007. Still, it certainly made its mark on the local residents during that time. It wasn’t actually playable, although both Pac-Man and the ghosts moved around. 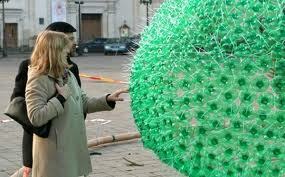 Made by Lithuanian artist Jolanta Smidtiene, this “tree” took 40,000 empty Sprite bottles to complete. It is famous for the eerie green glow it gives off at night, as the light from a nearby spotlight reflects off the bottles. 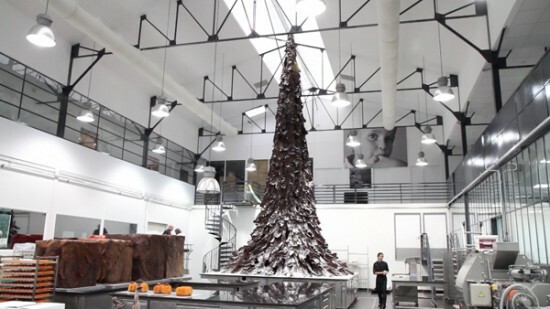 A French chocolatier created this tree. The tree stands 10 meters high and using the equivalent of 800,000 regular chocolate bars worth of chocolate and weighing 4 tons. 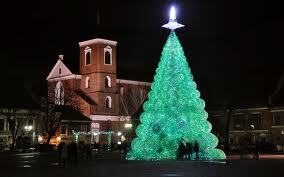 The tree was created in 2010 and features at Frances telethon charity event. The Gold Star tree is one of the traditional White House Christmas trees. 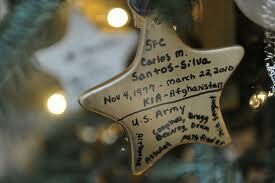 This year, it was decorated to remember fallen US soldiers in Iraq and Afghanistan, as well as their families. It is a beautiful tree that reminds us of the more traditional Christmas values. This impressive structure took 400,000 LEGO blocks to build, and is 30 feet tall. 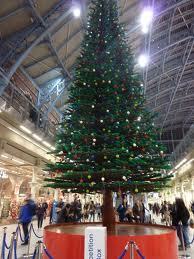 It can be found in St. Pancras International in London, UK, and amazes passengers every December. Every single aspect is made from LEGO – from the Christmas balls to the bark. This tree has an estimated value of $11 million. 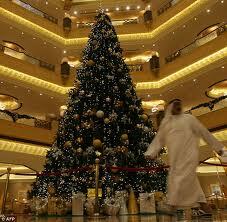 The tree was erected at the Emirates Palace Hotel in Abu Dhabi. There are necklaces, earrings and other jewelry drapes around the trees branches. It holds 181 diamonds, pearls, emeralds, sapphires and other precious stones. This tree is located in Wilmington, NC. 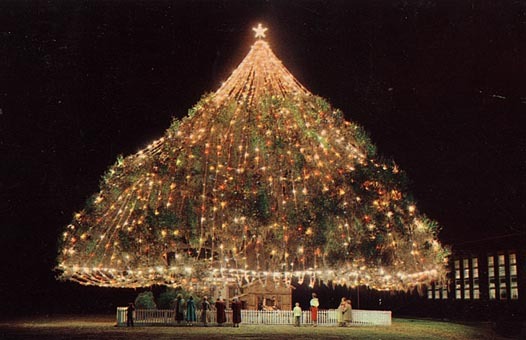 The tree is a live oak tree and has been lit up on Christmas since 1928. Due to the trees deteriorating health certain ceremonies around the tree have been cancelled but people can take a tour via there vehicles. 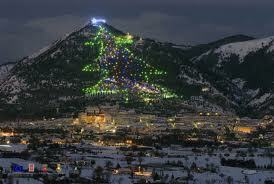 The biggest electronic Christmas tree in the world, this tree takes up the entire mountainside of a small Italian town called Gubbio. It was officially “lit” by Pope Benedict this year, using an Android tablet. This marked the first time a Pope had electronically lit a tree.